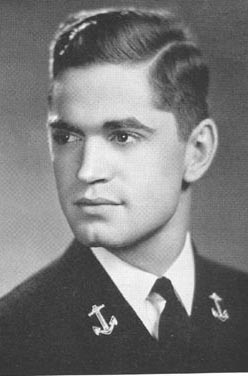 Victor Delano, Captain, born Dec. 20, 1919, Washington, DC, received his BS degree in electrical engineering from USNA in 1941 and his MS in physics from MIT. He joined the USN July 2, 1937, and served various military stations. Retired Dec. 1, 1969, with rank of captain. Awards include two Legion of Merits, Bronze Star w/V, Joint Service, Navy and Air Force Commendation Medals and the Purple Heart. Married Jacqueline Stinson June 23, 1951, and had two children and two grandchildren. She passed away Aug. 30, 1990. He was president of Wichita Eagle Publishing Co., 1970-71. He enjoys golf.